Fenix TK75 Flashlight 2018 Edition | Canadian Outdoor Equipment Co. The Fenix TK75 2018 edition is a powerhouse of a flashlight: 5100 lumen output, and up to 850m (!!) of throw. Who on earth needs a light like this? In marine applications, when searching for buoys or shorelines after dark, in search and rescue operations, in photographic applications (the flashlight can be mounted on a tripod), or when you just want to light up a large area fast. Dual stainless steel switches offer user-friendly output selection of 6 brightness levels and 2 flash modes, and a lockout function prevents the possibility of unintended operation of the flashlight. Need light? A lot of light? 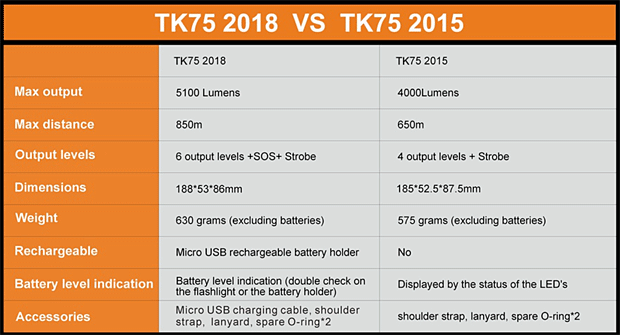 The TK75 is the flashlight for you. We ordered this flashlight for inspections of civil infrastructure. It is an extremely well made & robust peice of equipment at a very competitive price.